Double H Agency AW18 season looks to become one of the busiest of all the years. The London based fashion agency, with also showrooms in Manchester and in Dublin, will be present in Jacket Requires with Amov, will be showcasing for second time JT.Ascott, Carlos Cordoba and S4 Jackets at Indx Menswear (AIS Show), then the time for Pure London with the return of Garcia Jeans with Men and Women collection and finally will arrive the time of Moda Gents, one of the most important for the Agency and where Double H Agency will be attending the last AW18 of Carlos Cordoba and S4 Jackets. This Season the fashion menswear agency has decided to return again to Jacket Required, this time instead of Eden Park Paris, this season the brand selected to be at the tradeshow is AMOV. Amov is an Eco-fashion Scandinavian brand. All the products are produced in Europe, without any chemical production for the colours and also using 100% organic fabrics to produce his styles. This season the brand has been working hard with the “ICONIC” logo and name. The collection has been also worked in terms of fits and colourways. Amov will be for sure making a big impact inside Jacket Required next 24 & 25th of January. 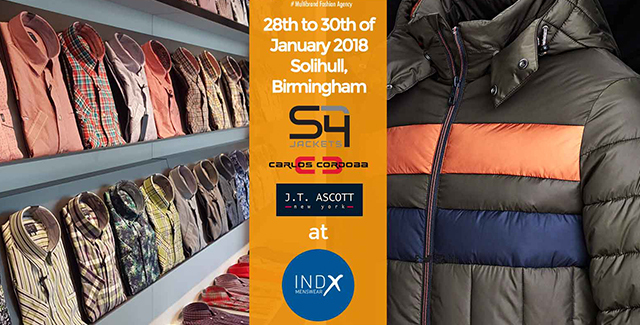 The Autumn 18 season the agency would like to move forward with Carlos Cordoba, JT Ascott, and S4 Jackets. That’s the reason why they will be present for first AW edition in AIS tradeshow. This show will be the first that will have the new AW18 collection of these three brands in the UK. The idea is to bring the collection and have the opportunity to show it to this department stores that are really looking for a point of difference and stop becoming another one that is stocking the same brands than the other one. In February is the time where the season is on the warmest point and then is the time to showcase the new AW18 Garcia Jeans Collection in the UK. Since the first weeks of January, the collection is available but is the time of Pure London when Garcia Jeans menswear will have his re-launch in the UK market as on the past the brand was more focused in womenswear collection. Juan and Andy will be present there to explain the latest, introduce the new marketing campaign and also the collection that will be presented before at Panorama Berlin. Finally, arrive the last one of the season, but not the less important. 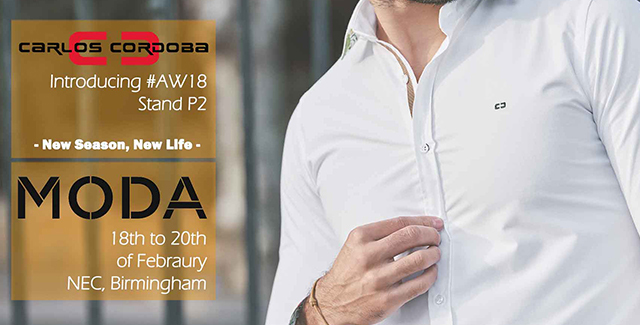 Actually, MODA Gent will be the place that the Spanish brand Carlos Cordoba will be introducing all the collection, private label opportunities and the latest in the NOOS collection in the UK. This season, they come back with a big improvement in the collection and as well in the “Never out of Stock” program. AFor Double H Agency will be also the place to introduce the Modern, Urban and Functional S4 jackets AW18 collection. The collection is unwavering, stylish, confident. In autumn/winter 2018, S4 Jackets is calling on proven tradition while having the courage to conquer new frontiers. Unwavering, stylish, confident. S4 Jackets is cruising through autumn/winter 2018 with functional, premium-quality materials. So save the dates of each show and Double H Agency is looking forward to seeing you in each UK show. For more info about any of these brand or to book your appointment just send an email to sales@doublehagency.com. First Blend He SS17 collection is ready!